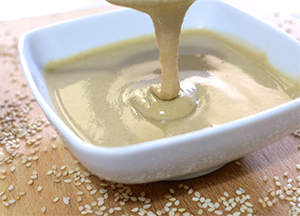 Tahini is mentioned as an ingredient of Hummus Kasa, a recipe transcribed in an anonymous 13th century Arabic cookbook, KitabWasf al-Atima al-Mutada. Tahini paste is used in a variety of dishes. Tahini-based sauces are common in Middle Eastern restaurants as a side dish or as a garnish, usually including lemon juice, salt and garlic, and thinned with water. Tahini sauce is also a popular condiment for meat and vegetables in Middle Eastern cuisine. In addition, it is a main ingredient in soups. As a spread, Tahini can replace peanut butter on bread, though the flavor and texture are quite different. In Turkey, tahini (tahin in Turkish) is mixed with pekmez to form a dish called tahin-pekmez. Due to its high-caloric nature, it is served as abreakfast item or after meals as a dessert to dip pieces of bread in, especially during the wintertime. In Iraq and some Persian Gulf countries, tahini is mixed with date syrup (rub) to make a sweet dessert usually eaten with bread. In Cyprus, tahini is used as dipping for bread and in Pitta Souvlaki rather than tzatziki, which is customary in Greece. In Syria,tahiniis a staple foodstuff that is used in a variety of popular dishes. It is used in numerous dips and spreads, including hummus, and is also served as a condiment with falafel and other popular foods, and sometimes used in desserts when sweetened with date syrup. In the Palestinian Territories, and specifically in Gaza, there are two varieties of tahina: the first is the standard beige-colored one; the second is known as "red tahina", named after the deep rust color that distinguishes it from its more widely known cousin. The color of red tahina is achieved by a different and lengthier process of roasting the sesame seeds, and the resulting taste is more intense. Red tahina is used in such Gazan dishes as Sumagiyya (lamb with chard and sumac) and salads native to the falaheen from the Gaza Strip's surrounding villages as well as southern Gaza. It is not widely available outside of Gaza. In Egypt, tahini is automatically added to virtually all sandwiches unless one requests it not to be. FulIskandrani (Alexandrian ful) is a popular preparation of ful with hot peppers and generous tahini. Tahini is also the main ingredient in the Mediterranean type of halva. Tahini is becoming more common in European cuisine and can be found as an ingredient in some pre-packaged sandwiches. Tahini is an important ingredient in hummus. Tahini is also used as a condiment for some Cantonese cuisine. Tahini is often used to thicken soups and salad dressings.